Indiana University Press, 9780253034786, 32pp. Learn the name of the swallowtail butterfly who loves to sit on the dogwood branch, see the majestic beauty of the black-and-yellow Argiope spider, or see what makes the beech tree so special (its bark is smooth and gray just like the skin of a hippo). 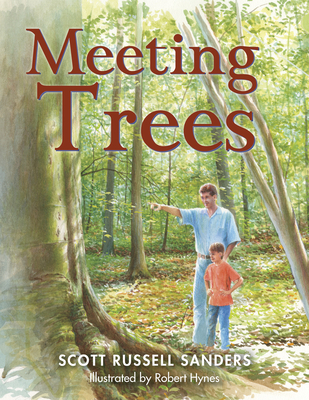 Featuring beautiful paintings by nature artist Robert Hynes and the exquisite language of renowned author Scott Russell Sanders, Meeting Trees captures the delicate details of bark, branches, and leaves while enchanting readers with the beauty of the natural world. Scott Russell Sanders is the author of more than two dozen books for children and adults, some drawn from history, some from imagination. As writer, teacher, and public speaker, he seeks to convey his wonder at the vast, marvelous, unending show we call nature, and his curiosity about the two-legged species to which he belongs. Robert Hynes is an illustrator for the National Park Service and Smithsonian Institution, among others. He has won numerous awards from The Society of Illustrators, Communication Arts, New York Art Directors Club, and Washington Art Directors Club.